For full, colour enriched lips that will last all day and night follow Enhance by Natural Compatibles four step lip application guide. For a longer lasting lipstick and more Feature Focussed™ look use a dark shade of lip pencil to outline your lips, starting with cupids bow and continue the pencil line completely around the lip line. 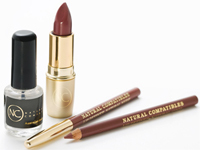 Fill in the lips with the same or a lighter shade of pencil before applying lipstick. This provides a base for long lasting lips. Begin inside the defining line, gently smudging backwards and forwards using short feathery strokes. Then place the pencil on the side and lightly fill in the entire lip area. Apply lipstick using a lip brush. A lip brush enables you to apply your lipstick with precision and give your lips that professional finish. Keep your lips looking radiant from day to night with Enhance by Natural Compatibles Lipseal. Enriched with Vitamin E Lipseal locks in lip colour for hours and hours. Prevents lipstick from smudging, fading or bleeding, ensuring a long lasting flawless finish. Apply liberal coat of Lipseal to lips after applying lip pencil and lipstick. Allow to dry with lips apart for 60 seconds. Each product in the Enhance by Natural Compatibles range has not been tested on animals and contains the finest quality ingredients including minerals, sunscreen, essential oils, Vitamin E and skin conditioning emollients.